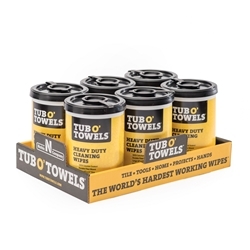 Tub O’ Towels industrial-strength wipes are specially formulated to be tough on adhesives, sealants, thin-set, grout, paint, dirt, grime, and many other messes. While designed to clean thousands of surfaces including tile, tools, metal, leather, floors, walls, auto interiors and exteriors, and so much more, these wipes are excellent at cleaning your hands. 10” x 12” OVER-SIZED WIPE is bigger, stronger and tougher to ensure maximum durability and performance. 100% SOLUTION SOAKED wipes, from the first to the last, come out of the container saturated and ready to work hard. CONTAINS NO HARSH CHEMICALS, only biodegradable detergents, solvents and emulsifiers that go to work dissolving grease and dirt. Foaming agents lift grime off the surface so it can easily be wiped away. DURABLE FIBER WEAVE wicks up moisture, enhances scrubbing and grabs dirt, while the quilted design of Tub O’ Towels offers cushioning and surface texture. VAPORLOCK™ CANISTER is made of heavy-gauge plastic with locking lid to minimize solution evaporation. TOUGH ON DIRT. GENTLE ON HANDS. Our wipes contain aloe, Vitamin E and lanolin to protect your hands and leave them clean and soft.